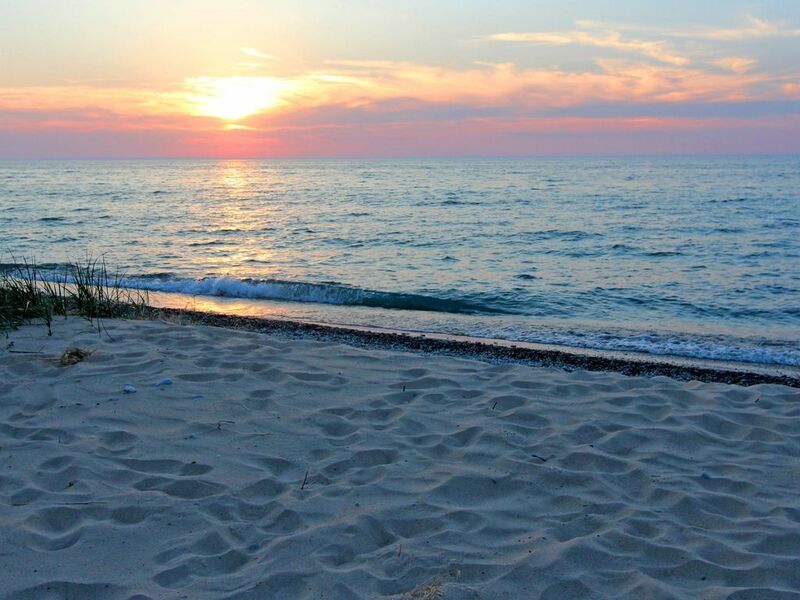 The Leelanau Peninsula is the setting for "NORTH BY NORTHWEST" a 3 acre Lake Michigan property with 300' of shoreline, spectacular views, a spacious private beach & pristine sand dunes. Located on Lake Michigan 16 miles north of Leland and 4 miles north of Northport and just south of Cathead Point and Cathead Bay. It's 15 minutes to the Leelanau Sands Casino and Suttons Bay is 20 minutes away.. It's another 20 minutes from Suttons Bay to Traverse City which has plenty to see and do. This 4 bedroom, 2 bath home is perfect for multi-generational family vacations as it accommodates 16. If you enjoy sleeping in the fresh air, our large screened in porch has a futon sleeper couch. There's plenty to do for all ages..... relaxing on the beach with a good book, swimming, building sand castles, long walks along the shoreline as you hunt for petoskey stones and other amazing fossils and stones in a variety of colors and designs. But be forewarned it's an addictive hobby and I just bought a rock tumbler because I have a garage full of rocks!. As the day winds down enjoy the sunset over Lake Michigan, toast marshmallows and make s'mores under the stars. Away from bright city lights the sky comes alive with thousands of twinkling stars, it's magnificent! The house is rustic with rough sawn cedar walls and a vaulted living room ceiling. It's casual and comfortable with a cozy ambiance. Our 8' farmhouse table comfortably seats ten and a small table behind the couch, 2 bar stools,and porch table accommodate at least 6 more. If you have a few extra guests for dinner the patio table seats another 5 people. This home is set on a beautiful wooded dune with 19 platform steps gently leading down to the house from the large lighted parking area. To get to the beach a set of stairs takes you down to the bottom of a very small sand dune. There are no stairs on the dune, but it takes about 25 small steps to get to the top where our firepit is located, then it gently slopes down to the beach. The back deck faces west with spectacular views of the water, Manitou & Fox Islands, & freighters which frequently travel through this area. This is the site of the treacherous Straights of Manitou which caused many a shipwreck in earlier times. After 16 years of living in various parts of the country we moved back to Michigan in 1989 with our 3 kids & settled in Traverse City where Lauri grew up. We wanted to be close to family and enjoy the four season beauty and slower pace of life in Northern Michigan. We looked for property in Leelanau County because it's still pristine and undeveloped. Jim's parents had a cottage on Lake Huron when he was growing up & he loved hearing the big waves at night, so he was happy to find this place with 300 feet of frontage on Lake Michigan. toilet, tub, shower, The sink area is separate from rest of bath. We are in a sparsly settled area 4 miles north of Northport, Michigan which is a small village of less than 600 residents year round but increases considerably when summer residents arrive. We have 300' of frontage on Lake Michigan, south of Cathead Point. It's secluded and sparsely settled but occasionally we see people walking the beach. It's truly a great place to escape and unwind. We have baseboard hot water heat with 3 thermostats. All beds (except trundle beds) are made up prior to your arrival. All towels provided including some beach towels. We have a living/dining room combination with a vaulted ceiling. In addition to items listed under cooking utensils we provide many basic spices, sugar, & flour, plastic wrap, foil, ziplock bags, garbage bags, dish soap, dishwasher detergent, napkins, laundry soap, stain remover, bleach, dryer sheets, toilet paper, bath soap, & hand soap so you don't have to buy everything or bring it with you. We don't provide paper towels though. Ask Kathy about other items we might have. Our large farmhouse table comfortably seats 10 but you may squeeze a few more chairs around the table. We also have a small table next to it & one on the screen porch plus 2 barstools at the counter. We have Dish Satellite TV plus local channels in the living room. We also have a TV and Dish receiver in the master bedroom. The front of the house has a balcony that runs the whole length of the house. The deck on the water side runs the entire length of the house. It expands outward on one end and has a built in bench around it and patio table with 5 chairs plus additional chairs along the deck. There is a nine hole golf course in Northport. Our house is located in a secluded area on Lake Michigan and was built on a wooded dune which has stairs going down to the house and more stairs down to the beach. The parking area is above the house and gently sloping wooden platform stairs take you down to the house. There's a small sand dune in front of the house and a set of stairs takes you from the house to the bottom of the dune. There are no stairs going up the dune but it's only about 25 steps to the top where our firepit is located. This is a wonderful place to sit and watch the sun go down. From the top of the dune it gently slopes down to the water.